Death was preferable. I caught the furtive glances at my parents as I celebrated my 13th birthday, and listened closely to the messages behind the jokes of terrorizing adolescents. Obviously, teenagers were nightmares of worry-causing trouble, high-pitched giggling beneath the eye shadow and shopping passion. Teenage girls were petty and shallow, argumentative and boy-crazy. They hated their mothers and rebelled against their fathers. They slammed doors while getting drunk, shedding sweet lovability in hallways. They were dreaded beings that had to be survived and I wasn’t going to become one. I lurked in corners of adult conversation, jotting down ‘What not to be’, certain that with the right knowledge I could prevent the teenage stench and avoid being the object of parental weary sighs and eye-rolling frustration. Plus teenagers were just one hop away from becoming a grown up. A fate marked by mind-numbing routine, 9-5 jaunts serving solely to pay for the car to drive you home, the bed to crash upon, and the coffee to jolt you awake, rinse and repeat. I was missing the appeal. I couldn’t understand how they did it, these commuters hurriedly applying mascara at the red lights, the permanent brow furrows my mom sported while juggling hot dinners, Hebrew school pick ups, spotless floors and volunteering. How did my dad wake to his 6 am buzzer, slip on his white lab coat and not strangle the masses with strep throat, diabetes, high blood pressure or loneliness that he tangoed with in rushed 10 minute consults? Was I the only one seeing the futility in Grown Up land? Was I missing the secret, the hidden purpose making it all worthwhile? I studied my accessible adults: aunts and grandfathers, parents and teachers, sure there must be a redeeming prize hidden within the soft eye wrinkles. Nothing. So I spent the next 15 years grasping at childhood straws, shrinking ounce by ounce in a thin attempt to maintain my kid status. I was sure I wasn’t missing a thing, living my small life in my imaginative never-never land, definitely not a little girl but not even close to a grown-up. I waited for my instruction manual, searching for Adult 101 in my course listings. As friends got married and settled into independent lives, I watched with wonder, secretly jealous as I scoffed with disapproval over their Grown Up crowns. What was happening? We were the kids, meant to be packing for summer camp and writing book reports, backseat residents and the receivers of bedtime stories. They were the grown-ups back then, high heeled in responsibility, absolute possessors of universal truths and magic kisses to make it all better. They were adults, strong and confident, wise and fearless. Titles of ‘Mom’ and ‘Dad’ superseding lingering childhood, they were the final answer, protectors of safety, and owners of life’s guidebook. I watched her put on her make-up, superfluous to the beauty I saw early in the morning, as I tasted a glimpse of this ‘other life’, cast in moonlight skies and whiffs of Escada perfume. They were old, with kids and houses, jobs and responsibilities. They had all of it figured it. They must! I needed to believe that these two tall figures knew exactly what they were doing, that they really could deliver the sun, and that soothing words erasing fears were based in reality and not merely placating an anxious daughter. They were grown-ups; of course they had it all together. 1. She had no more clues about life and parenting and living in her skin than I do now and was just making it up as she goes along, which induces the crumbling of childhood pedestals and notions of ‘when I grow up’ I’ll somehow be granted the missing key. 2. She was much more grown-up than I and really did have a life plan and know how to stand on her own two feet without peering around corners for approval and help. In that case, I am shockingly delayed. Without the kids, house, or spouse, I have somehow stepped off of the timeline. ‘Grown Up’ has always been inversely defined by my two older cousins. At 10 and 8 years older, whatever birthday they were celebrating immediately became fair game, un-adult, not old. They can’t old. We’re still sitting at the kid’s table. And my parents can’t be old. They’re no different than they were twenty years ago, so as the years pass, I simply slide the ‘old’ marker up a few years, protecting those I love from having to dip a toe into the danger zone. But I look around and I know, secretly seeing it in my little cousin’s eyes. I am one of them, crossed over into the grown up camp. I wish I could tell him the secret: I feel just like you, only with a few more stories to tell. We are adults. We’re all in our twenties, thirties, forties, out living independent-ish lives, getting married, getting divorced, having kids, slipping on our own high heels. I’ll consider being Grown-Up-ish. I’ll mull over the idea that this fault line following childhood might have been imaginary, and that adulthood just may hold some appealing qualities. I’ll learn that adult doesn’t equal alone, and that interdependence is a perfect compromise between toddler reliance and hermit independence. I’ll ponder freedoms appreciated and discover Grown Ups get to make their own rules, or at least add multiple amendments. I’ll debate the merits of responsibility over the stress of bills, and laugh amidst days spent in pj’s. I remember my grandmother looking in the mirror as I fastened her necklace, caught off guard as if she couldn’t match her 85-year-old face with the young girl she was somewhere beneath the wrinkles. I’m guessing that’s how it goes. We all skip and stumble, take risks and laugh through the falls. We do the best we can in the absence of instruction manuals, and we try to fill the oversized shoes left behind. We banish monsters from the closet and kiss skinned knees, hoping that they won’t notice our own fears. We are all kids playing as grown-ups, with sweet insecurities poking out as we build our Lego lives and pray that somehow it will end with ‘Happily Ever After’. I’ll concede to being an almost Grown Up. It's good to hear form you again. 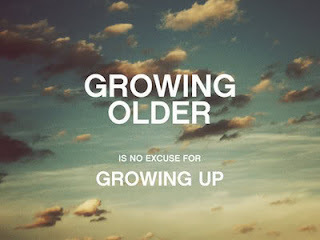 I love being an adult, but I will never stop growing. I guess what I am trying to say is enjoy your journey, keep making connections, keep being grateful, cultivate compassion --- just keep growing.